There are always a number of highlights that stand out during a weekend of NFL games. Here are five that stick with us at Tiebreaker.com. San Francisco really didn’t need to hear the diagnosis on Monday. From the moment quarterback Jimmy Garoppolo’s knee twisted in that grotesque way at the end of a third-and-goal scramble from the Kansas City 20, the 49ers realized the news would be bad. And it was as bad as they feared. 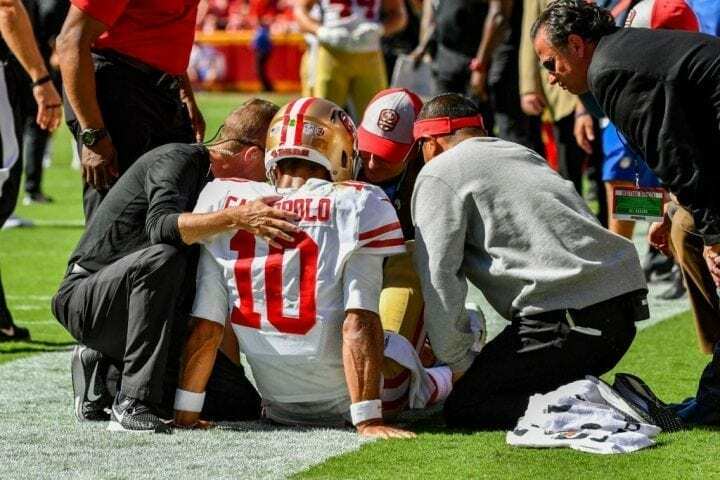 Garoppolo’s season, perhaps his team’s, as well, is over after an MRI confirmed a torn ACL. It just made Sunday’s 38-27 loss to the Chiefs even harder to take. At the end of a 13-yard gain, Garoppolo, 26, took an awkward step at the sideline after deciding not to run out of bounds and his leg collided with defender Steve Nelson at the Chiefs’ 7. He immediately fell to the ground in obvious discomfort. Eventually, he hobbled his way back to the bench where the team’s medical staff converged before he was taken to a medical tent for further evaluation. Before the injury, Garoppolo completed 20-of-30 for 251 yards and two TDs. For now, the plan is to replace him with backup C.J. Beathard, who started the first five games of the 2017 season for the Niners. including their first win against the New York Giants. San Francisco acquired Garoppolo from the Patriots last Oct. 30 and he took over at quarterback late in a Week 12 loss to the Seahawks, The 49ers won their final five games and signed him to a five-year, $137.5 million deal. But now everything seems to be on hold for a team that is 1-2. “It’s a big deal,” 49ers coach Kyle Shanahan admitted. It’s doubtful another game will be played this season — or maybe ever — that leaves us in as much shock as Buffalo’s win over the Minnesota Vikings. 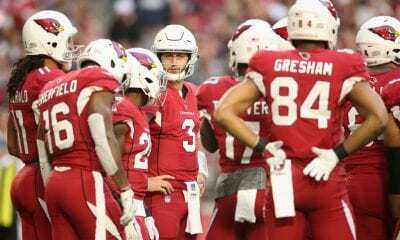 Coming into the game, the Bills and Arizona Cardinals likely shared the distinction of being the league’s foremost embarrassments. And the pregame point spread, the Vikings as 17-point favorite, probably made up you think it was too kind. As it turned out, the line insulted the Bills. 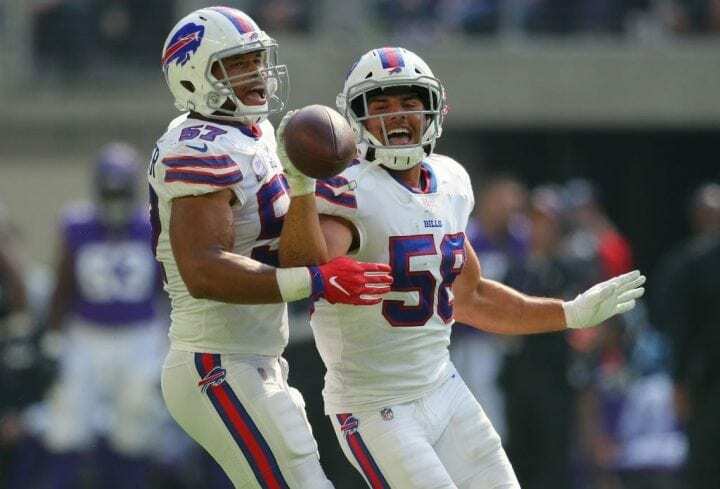 After allowing 78 points in their first two defeats, and struggling offensively with first-round pick quarterback Josh Allen learning on the job, Buffalo stunned the Vikings 27-6. “Everybody’s going to doubt us,” Bills safety Jordan Poyer told The Athletic. “Everybody’s going to pick us to lose. We know that. Now listen to this: In the annuals of risking lunch money on NFL games (at least as long as Pro-Football-Reference.com has tracked it), no team has ever turned a betting line as inside-out: from a 17-point underdog to a 19-point win. Not in 23 years had an underdog won as decisively. The Bills scored on their first five possessions and led by 27 at the half and they did it with halfback LeSean McCoy who was nursing his ribs. Allen (196 yards passing) ran for two touchdowns and passed for a third in the first half, just the third rookie in the Super Bowl era to do so. And he did not throw an interception. 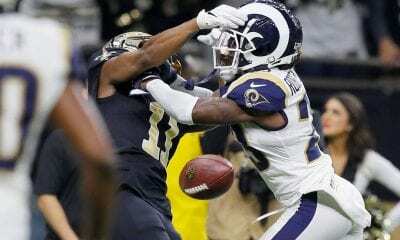 Buffalo’s defense also sacked Kirk Cousins three times in the first half, allowing just 46 yards and two first downs without allowing the Vikings to cross the 50 until the third quarter. It’s very possible Patrick Mahomes, stellar quarterback of the Kansas City Chiefs, may now be the game’s brightest star. And why shouldn’t he be? The kid now has 13 TD passes, the most by any QB in the first three weeks of a season. And this comes after he had 10 after two weeks, also the NFL record. Your calculator says this computes to 69 TD passes this season and that’s a lot. Peyton Manning tossed 12 in his first three weeks on his way to an NFL-record 55 in 2013 and the Denver Broncos played in the Super Bowl. Mahomes (24-of-38, 314 yards, on interceptions) had three in KC’s 38-27 win over the San Francisco 49ers to help the Chiefs go 3-0. The Chiefs are the first to score at least 38 in each of their first three games since the 2007 New England Patriots. And Mahomes already has hit nine different receivers for TDs. Matt Ryan set that record (13) when he was the NFL’s MVP in 2016. The Dolphins climbed to 3-0 with their 28-20 win over the Oakland Raiders, who are now 0-3 and likely wondering if their might have been a better way to spend $100 million than on Jon Gruden. This all adds more excitement to next week’s game against the Patriots. But more on them later. Quarterback Ryan Tannehill is not Tom Brady, as if you needed to be reminded. But teams have won Super Bowls before with QBs that know how to manage games and Tannehill may just fit that description. Miami is now 10-1 in games Tannehill has started since 2016. Remember, he missed last season with a knee injury. Is that good? Well, only Carson Wentz is 10-1 in his last 11. Against Oakland, Tannehill completed 17-of-23 for 289 yards with three TDs and no interceptions. His passer rating was 155.3. And the Dolphins needed every bit because Tannehill also led them in rushing yards (26). There is good news for teams that start the season 3-0. They have a 73.9 percent chance to qualify for the postseason. That sounds a lot better than the fate (2.2 percent) that likely awaits 0-3 teams like Oakland, the Arizona Cardinals and Houston Texans. This is also the 14th time the Dolphins have started 3-0 and they made the playoffs in nine of the first 13. That includes three AFC titles and one Super Bowl win. 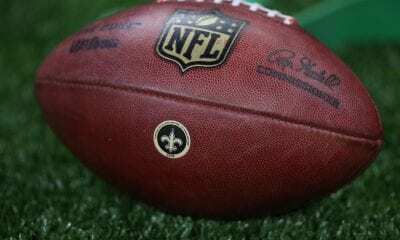 There is so much to talk about after watching the Detroit Lions humiliate the Patriots 26-10 on Sunday Night Football. How great was it seeing Lions coach Matt Patricia, who worked for Bill Belichick for 14 years, running across the field to embrace the hoodied one? Look, the Patriots have started many seasons in substandardly and recovered to play in Super Bowls. They were 2-2 last year and you know how that ended up. So no one is counting them out, unless, of course, the Dolphins beat them to build a three-game lead in the AFC East. Then a standing 8-count might be appropriate. Still, facts are facts. Not since 2002 have the Patriots suffered consecutive double-digit losses. And it’s clear Brady doesn’t have a lot to work with until Josh Gordon is ready and Julian Edelman returns from his suspension after next week’s game. New England had only 12 first downs and 209 yards and its defense couldn’t get off the field, allowing 25 first downs for the second straight time. Hey, maybe Rob Gronkowski may even regret he turned down the chance to be traded to the Lions before the season.